I remember as a little girl one of the first things my Mother taught us to crochet was a weather snake. These were long tubes that we crochet using a variety of stitches. This one is made using the half double stitch.These snakes would be placed at the bottom of doors or windows to stop the drafts, and it is a great way to use up scrap yarn. I hate throwing anything out, so I stuffed mine with stuffing from a pillow that someone had given me. 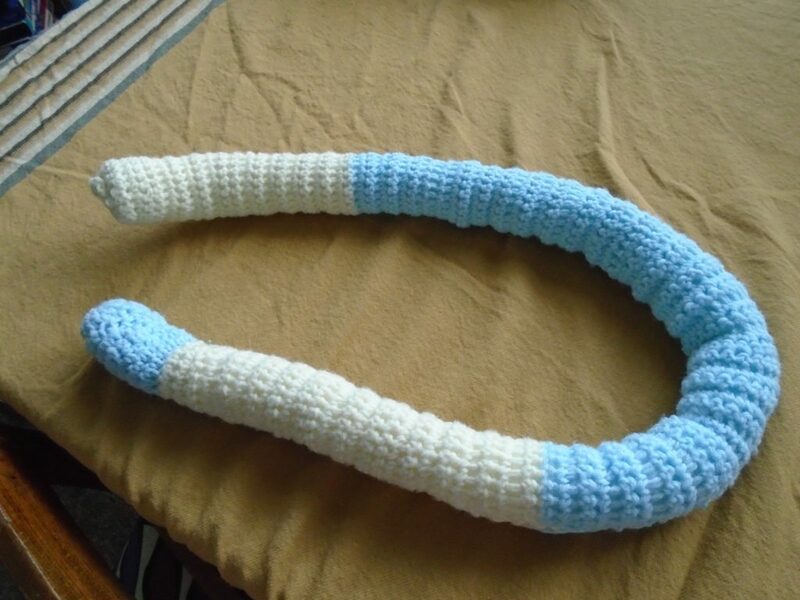 Below are the instructions for a Crochet Weather Snake. Great for stopping drafts under doors or windows! Chain 4. Join into a circle with a single stitch. Row 1: Chain 2, Insert hook into circle, pull up thread, pull thread through both loops on the hook. This is what I call a half double crochet. Do this 18 times, for a total of 19 half double crochets, the first double crochet is the chain two. Join each row with a single stitch and start each row with a chain two. Repeat this until your snake has reached its desired length. This particular snake is 39 1/2 inches. I found it easier to stuff the snake as I went along. I would do four or five rows, then stuff in a handful of the batting from the pillow I was up cycling. I have enough stuffing from this one pillow to do quite a few projects.